A report by Kayla Tausche for CNBC profiled Good's facilitation of BYOB, noting the company's plans to promote the idea that "BlackBerry is no Good." Major banks, including Morgan Stanley, Bank of America, Credit Suisse and JPMorgan Chase, as well as some of the largest healthcare organizations, have adopted Good's platform, enabling them to "ditch their ancient BlackBerry." Good's chief executive Christy Wyatt has previously worked for Apple, Palm, Google and Motorola. In 2006, Motorola acquired Good for $400 million in an attempt to compete more directly with RIM and its popular BlackBerry Enterprise Server. Two years later, Motorola sold Good to a push email provider at a steep discount. Google later announced plans to purchase Motorola Mobility in late 2011. Since then, Good has developed its business around supporting and securing mobile devices from Windows to Android and iOS. 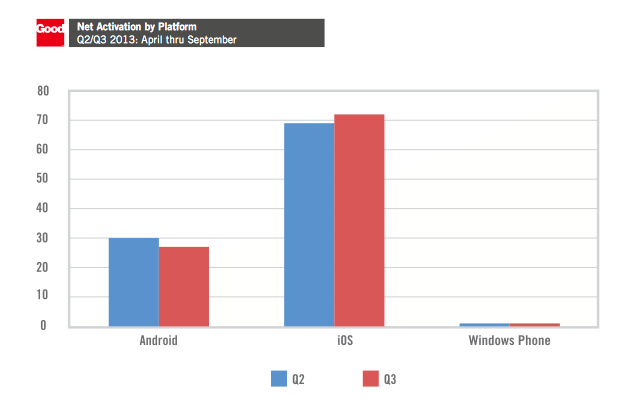 The company's quarterly metrics indicate that its clients are not interested in Windows Phone and that adoption of Android is slipping, while Apple's iOS now accounts for 72 percent of all mobile device activations in Q3. Good also reported that iOS accounts for the majority of mobile phones and that iPads make up 90 percent of mobile tablets used in the enterprise by the firm's clients. The company also noted, "iOS dominates as platform of choice for enterprise app deployment, with 98 percent and 95 percent of total app activations in Q2 and Q3 respectively." Good is in the headlines now as the company eyes making an Initial Public Offering, and as BlackBerry continues its decline. "We've actually grown our active users by 50 percent within the last three quarters," Wyatt stated.